For more than 20 years, lawyers in the Madison office have played key roles in helping clients find creative solutions to a wide variety of legal and regulatory problems. Our practice in Madison has diversified significantly over the years to reflect the growth of the Madison metropolitan area, which is now home to more than a quarter-million people and is one of Wisconsin’s fastest growing regions. The office itself is located at the heart of the state capital, on the isthmus between Lakes Mendota and Monona. Our building is situated directly across the street from one of the country’s most beautiful (and tallest) state capitol buildings and is a short walk from the Monona Terrace Convention Center, inspired by Frank Lloyd Wright. Our Madison office takes great pride in both its people and its location, and not without reason. Madison was named the #1 city for young adults by Kiplinger in 2012. Indeed, Madison consistently ranks among the top cities in the country for its quality of life and its diversity. Recent recognition includes “One of the 50 Fabulous Gay-Friendly Places to Live” (“50 Fabulous Gay-Friendly Places to Live,” Gregory A. Compes); “One of the 10 Best Places to Live the Athletic Life” (geezerJock, Fall 2005); and a ranking in the top 50 out of “100 for Business and Careers” (Forbes, May 2009). The city is diverse and perfectly happy to be so — home to a fast-growing population of Asian- and African-Americans, with a minority population of more than 16 percent of the total. At the University of Wisconsin alone, there are over 4,000 foreign students who represent more than 126 countries. You’ll be surprised with how much Madison has to offer. The town’s commitment to the arts is evidenced by the venues and caliber of performances available. The Overture Center, a multimillion-dollar community-funded arts venue dedicated to bringing top-notch acts to the city, is a great example of exciting developments in the Madison arts community. Additionally, Madison boasts the Madison Repertory Theater, Madison Opera, and Madison Symphony, all of which enjoy a reputation of artistic brilliance. According to the Greater Madison Convention & Visitor Bureau, Madison has more restaurants per capita than any other American city. Downtown alone, the gamut of ethnic foods is available, including Asian, Italian, Mexican, European, seafood, and good old-fashioned American pub food at one of many Madison-area microbreweries. If you’re into consuming vast amounts of great food, Madison certainly has what you’re looking for. The outdoor experience in Madison has been likened to dog heaven (except it’s pretty nice for humans, too). Madison is a sanctuary of nature-laden outdoor activities that can’t be touched by other cities. Nestled among four lakes — Lake Monona, Lake Mendota, Lake Wingra, and Lake Waubesa — Madison has hundreds of miles of trails that provide year-round sporting opportunities. And located on the south shore of Lake Wingra, the Arboretum has easily accessible wooded trails on which to enjoy recreational activities surrounded by nature. Biking, hiking, golf, skiing, and a variety of water sports are all readily available within minutes of the Quarles & Brady office and most homes throughout the area. And for those who prefer to engage in athletics from the comfort of an overstuffed arm chair, we’ve got plenty of spectator-friendly sports too. The UW Badgers football and basketball teams are perennial contenders in the Big Ten Conference and are both ranked nationally each year. The Kohl Center university sports arena is a magnificent venue for watching basketball, hockey, and other exciting events. Nearby, the Madison Mallards, the city’s minor-league collegiate baseball team, can provide a nice break too. Across the country, the name “Madison” is synonymous with The University of Wisconsin. With over 40,000 enrolled students, UW has something to teach everyone. Oh, and they’re good at it, too — U.S. News and World Report ranked 70 of UW’s program areas in the top 10 of their fields nationwide, and the university is the country’s seventh-ranked public university, offering over 5,100 courses in more than 160 study areas. Madison also offers studies at several private and technical colleges throughout the greater Madison area. 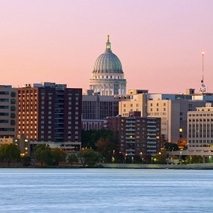 For more information about this great city, click on http://www.madison.com/ or http://www.greatermadisonchamber.com/.